As promised, here's my update on horsemeat. I fixed it for my main meal yesterday. The meat is deep red, fine-grained and dense. It is very lean. The two pieces in my package were cut much like a thin flank steak. I usually like my meat saignant or rare, but for my first try with this meat, I decided to cook it a point (medium)...'just because'.I salted the meat and added a sprinkling of generic meat seasoning.Following the directions on the package, I sauteed each side in olive oil for 1 minute on high heat, then lowered the heat and cooked it another minute on each side. I have to say....I liked it a lot. It was a bit chewy, but I think that was the problem of cooking it medium. Like other very lean meats, over-cooking toughens it. It tasted much like good beef. If I ate it thinking it was beef, I would never doubt that it was just that. A baked potato, salad, bread and cheese accompanied by the nice Cahors wine I won at the Telethon rounded out my Sunday dinner. I give horsemeat a thumbs up. I will definitely eat it again! I'm sure I've eaten it, although I don't remember much about it. 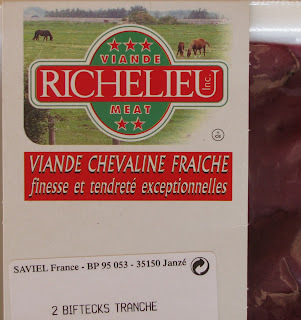 When my husband lived in Limoges in the 70s he went to a horse butcher regularly. There's still one in Villefranche de Rouergue.